Halfway through the R/V Falkor expedition to map the Papahānaumokuākea Marine National Monument, we have traveled nearly 4000 km and mapped many areas, including the Rogatien Ridge and the Gardner Pinnacles. 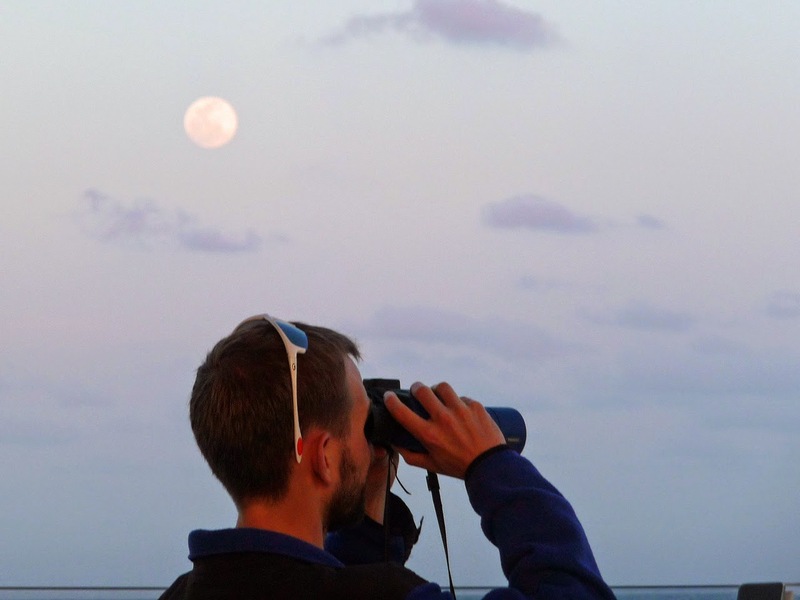 Along the way, we have to take turns keeping watch for whales and diverting the ship away from them if necessary in order to maintain a safe distance due to the ship's active sonar. My turn taking watch is usually the hour before and after dinner out on the ship's upper deck, which means I get to witness many spectacular sunsets and moonrises. My colleagues on the sunrise whale watches have remarked at how bright Venus can be. 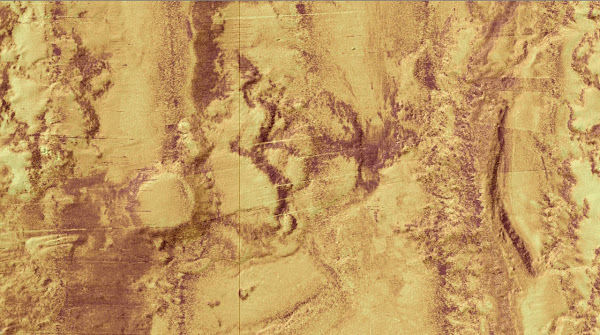 This got me thinking about just how similar mapping the seafloor is to mapping the surface of Venus. Can you tell which of the two pictures below is from Earth's seafloor and which is from Venus? Both are backscatter images. One is produced by radar and the other by sonar, but the principle is the same. You send a pulse of energy down and record how much of it bounces back along the same track to you. Backscatter tells you primarily about surface roughness, helping one determine the texture and type of soil reflecting the signal. The biologists and geologists on board like this type of data because it helps them discern marine habitats, debris flows, and potential future dive sites for submersibles to collect samples. 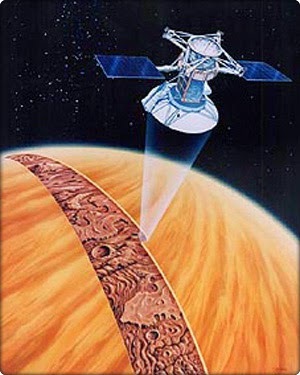 Most of what we know about the surface of Venus comes from the Magellan mission (1989-1994), which used synthetic aperture radar (SAR) to peer through the planet's dense atmosphere. Coincidentally, one of my first jobs in college was mapping remote parts of the Arctic and Antarctic with SAR, which today is also used to view land deformation due to earthquakes in near real time. This week scientists have gathered in Houston for a Workshop on Venus Exploration Targets to identify and evaluate key locations for future exploration of this enigmatic planet. 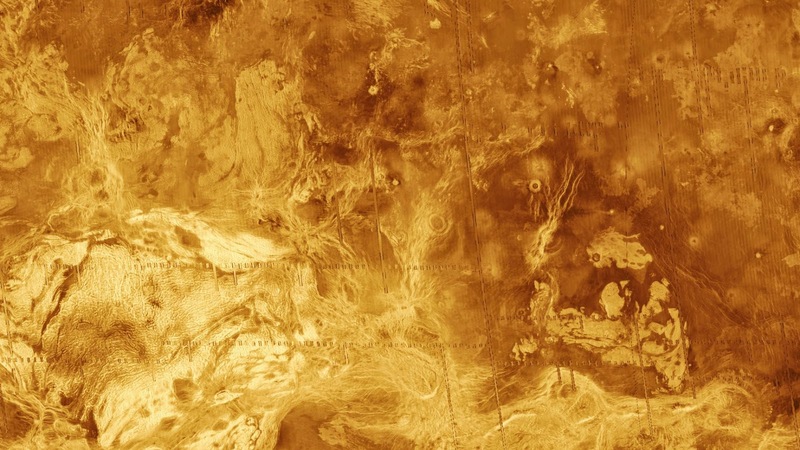 Why the climate of Venus is so different from Earth's remains a mystery that only further missions can help answer. I know enough about the sea to know how pitifully little we know about it. We have not, as a nation and a world, been alert to the absolute necessity of going back to the sea for our survival. I do not think $21 billion, or a hundred of the same, is too high a price for a round-trip ticket to the moon. But it does seem unrealistic, unreasonable, romantic, and very human that we indulge in these passionate pyrotechnics when, under the seas, three-fifths of our own world and over three-fifths of our world's treasure is unknown, undiscovered, and unclaimed. ... My passion for the world's seas and underseas does not lessen my interest in our space probes. When the astronauts go up in their beautiful skyrockets, my stomach goes up with them until it collides with my lungs and pushes them against my throat. ... Experiments are going on all over the world. Cousteau has men living undersea, and so has the American Navy. Men are learning the techniques of changing pressures. Whereas the astronauts must become accustomed to weightlessness and vacuum, the undersea men must learn to endure the opposites. They receive little official encouragement. ... There is something for everyone in the sea—incredible beauty for the artist, the excitement and danger of exploration for the brave and restless, an open door for the ingenuity and inventiveness of the clever, a new world for the bored, food for the hungry, and incalculable material wealth for the acquisitive—and all of these in addition to the pure clean wonder of increasing knowledge. Thanks! I have gotten behind on my blogging and now have 10 posts queued in draft form. As soon as I get time to finish them, I'll post them online. I complete site redesign is coming this year too, hopefully sooner rather than later. Wow! It's so interesting :o Thank you for sharing!